After a marvelous time in the mountains of Wyoming and Montana, it was time to head east through the high deserts of Wyoming and across Nebraska and eventually back home to Kentucky. After a restful evening at the Moose Creek Lodge in Cody, Wyoming, I was ready to hit the road running early the next morning. I had visited Cody in 2013 and so I didn’t spend a lot of time, but I did want to get back over to the Buffalo Bill Center and take some pictures of some of the numerous statues there. After about 30 minutes in Cody, I was soon heading southeast on Wyoming Highway 120 towards Thermopolis. This is a scenic drive through rolling hills of sage brush. I drove through the town of Meeteetse (Where Chief’s Meet) and then on to Thermopolis. Hwy 120 ends in Thermopolis. 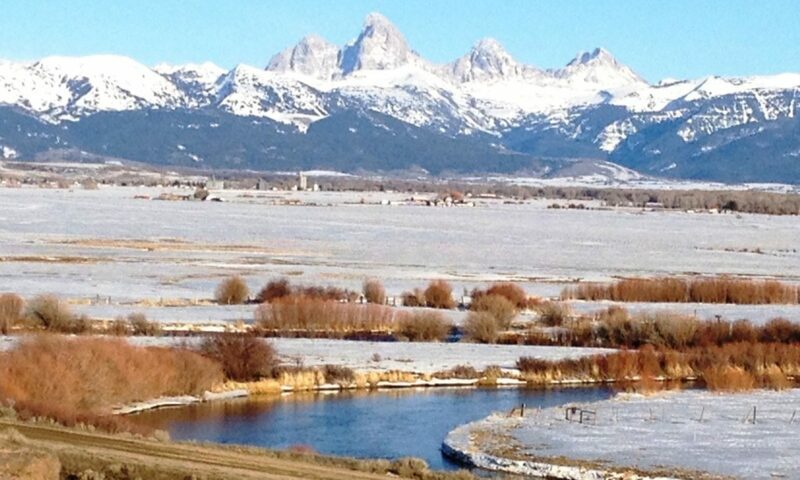 This town is home to the world’s largest mineral hot springs and the Wyoming Dinosaur Center. From the south Thermopolis is the gateway to Yellowstone Country, and coming from the north it is the gateway to the Wind River Canyon. Of course, I always keep my eyes peeled for unique things when I drive through a town. Here are a couple of good ones. Since I was pushing to get to Carhenge before dusk,I rushed through Thermopolis and proceeded east towards the Wind River Canyon on US Hwy 20. US Route 20 is actually the longest highway in the US, spanning 3365 miles across the country from Newport, Oregon through Idaho, Montana, Wyoming, Nebraska, Iowa, Illinois, Indiana, Ohio, Pennsylvania, New York and ending in Massachusetts. The Wind River Canyon drive follows US 20 along the Wind River for about 14 miles and into the depths of the canyon, sometimes 2400 deep. It is amazingly scenic as the highway winds it’s way around 34 miles of bends and through Rock carved tunnels, finally opening up near Boysen State Park and ending up in the small town of Shoshoni. I have been through this canyon twice before and have always been amazed at the engineering genius of gnawing a path through this wild gorge. There are even a number of pullouts that provide unique views up and down the length of the canyon. One of tunnels tunnels on US 20 through the Wind River Canyon. These tunnels are hewn stone and must have been a massive undertaking. As I left the canyon, the spacious Boysen Reservoir was to my right (looking West) and beyond the lake in the distance were the snow capped peaks of the Wind River Mountain Range. Gannet Peak, Wyoming’s highest mountain at 13,804 feet, is part of this massive range that stretches about 100 miles from north to south. There are more than 40 named peaks over 13,000 feet in this mountain range. US Highway 26 and US Highway 287 skirt this range to the east in Wyoming through Dubois and Lander. I hope to drive those roads sometime in the future. Boysen Reservoir with the Wind River Mountain Range in the distance. Just past the south end of Boysen Reservoir, US 20 continues into Shoshoni and the southeast towards Casper. Shoshoni had the appearance of a dying town to me. There were a few old buildings with some nice Native American murals, but the town really appeared dead. Heading east on US Routes 20/26, I immediately drove by a number of unique rock formations along the side of the road. The sandstone pillars have been eroded away over centuries of time to create these nice designs. It is a bit of drive, but fortunately, there is a rest area east of the small town of Hiland. A couple of nice history signs as well. About 4 miles from the rest area on the south side of the road is a turnoff to Hell’s Half Acre (near Powder River, WY), a large scarp with deep ravines, canyons, caves, rock formations and hoodoos. I have a love of these types of things. I was so very disappointed to see a chain link fence keeping visitors from being able to grasp the full extent of this place. It was here that I met a new friend…a fellow traveler, a fellow photographer, a fellow blogger. A a professional photographer, Derek Ace does some amazing work. You can see some of his best work HERE. Turns out that Derek is from Middleton, Wisconsin, which had me talking right away since Middleton is also the home the National Mustard Museum, one of my favorite places (see my post about this from my old blog). You can really get a nice sense of Derek’s work from his Facebook Photo stream. I am glad to have made his acquaintance on this trip and I am looking forward to what I believe will be an amazing set of photos from HIS visit there. Not too far east of Hell’s Half Acre is the little dot on the map known as Powder River, Wyoming. There are probably less than 40 people here. However, there was one place that took me back…and in the middle of nowhere too. Apparently, as late as 2005, this place was being used a strip joint and oil workers, folks from Shoshoni and nearby Casper, would venture their way to this hole in the wall place. It closed in November 2005 and now sits as another ghost on a basically deserted highway in the middle in Nowheresville, welcoming the passersby. From Casper I jumped on Interstate 25 to head east toward Douglas. This was one of the few Interstate ventures I took while on the road. There’s a jackalope in them thar hills!! On the approach to Douglas, which is the “Jackalope Capital of the World”, there is a giant jackalope up on a hill overlooking Interstate 25. It is the first sign of Jackalope everywhere…. This trip was my second one to Douglas, the first with my son Solomon back in 2007. I also wrote a guest post about the Jacakalope for author/blogger Tui Snider’s Mental Mosaic Blog (see my article HERE). However, on this trip I wanted to make sure I also got my Jackalope Hunting License. In the visitor’s center I was kindly greeted by Chamber Assistant Director Patty Morrell who took time to show me around, tell me a bit of history AND get me all set with my OFFICIAL “Limited Non-Resident Jackalope License”. She also was kind enough to slip me a Jackalope Sticker and a Jackalope pin. I should note that the Douglas Visitor’s Center also has some nice trains to look at if you are interested in these. Before heading out of town I came across the White Wolf Saloon in downtown Douglas. Another great Kitschy place. Had to take a couple of shots. Of course, I had to move on to get to Carhenge in time so I was back on US 20 heading east towards Lusk, Wyoming. US 20 and US 26 split at Orin Junction south of Douglas and that is where US Route 18 begins and joins with US 20. But, one of the more unique dots on the map on this stretch of highway is Lost Springs, WY. In 1976 the town was designated as the smallest incorporated town in America. At the time, its population was eleven. In 2007 I drove through and, at the time, it was one of only a handful of towns in the US with a population of 1. Here is a photo of me from that visit. On this visit the town had boomed back to a population of FOUR…. Sumoflam at Lost Springs in 2014 – ironically I was wearing the same shirt 7 years later!!! I had hoped to actually drop into their Post Office/Shop, but they were closed. Nevertheless, here are a couple of shots of Lost Springs today (I took some in 2007 too). Lost Springs Welcomes You. Well, not quite…nobody was home. Back on US 18/20 I continued east. Lots of highway and long trains and even an old truck stop in the middle of nowhere. From Manville it was on to Lusk, Wyoming. Yet another small town on the road, Lusk boasts a population of about 1500. Just a stop on the railroad tracks, it does offer one unique site….an old wooden train water tower. The old water tower was originally built in 1886 to furnish water for the Fremont, Elkhorn, Missouri Valley Railroad Steam Engines. The town of Lusk was established at the same time. The wooden tower is round, with a diameter of about 25 feet. The tank is about 25 feet high on a 25-foot base. The structure is believed to be composed of Douglas fir, while the tank itself is redwood. It is apparently the only surviving structure of its kind in Wyoming. After a brief stop in Lusk it was eastward towards Nebraska, with a flyby past Van Tassell, the last town in Wyoming. And into Nebraska I rolled…. On the border, there is a building with a windmill growing out of it…. This section of US 20 is also called the “Bridges to Buttes Scenic Highway” and runs for about 200 miles across northern Nebraska. This is Nebraska in its rawest form, as the subtle and rolling sandhills transform into striking and majestic bluffs and buttes. From the rolling hills, the scenery opens up into beautiful buttes on the approach to Crawford, Nebraska. From Crawford I headed southeast on Nebraska Highway 2 towards Alliance. This highway was a nice drive through the small town of Hemingford, Nebraska. I loved the little police station in downtown Hemingford. One of the smaller ones I have seen. From Hemingford it was on to Alliance, one of my main destination goals for this trip…. Due to the nature of this great roadside attraction, I have actually done a full blog post on Carhenge. You can see that HERE. So, I’ll just add one last photo below…you can see the rest on my other post. From Alliance I still had a ways to go as I continued on Nebraska Hwy 2 towards my final destination for the day, Grand Island, Nebraska. This section of Hwy 2 is also known as the Sandhills Journey Scenic Byway. The drive from Alliance to Grand Island was still about 272 miles so I was literally driving into the sunset over the beautiful rolling Sandhills of Nebraska. The Sandhills represent the largest remaining grassland ecosystem in the United States that is still virtually intact for both flora and fauna. It is the largest sand-dune area in the Western Hemisphere and one of the largest grass-stabilized dune regions in the world. I wish I could have taken more time to see it, but I did get to enjoy a fabulous sunset as I passed the small town of Hyannis, Nebraska. I continued for a couple more hours on Nebraska 2 finally arriving in Grand Island about 1 AM after a drive of about 720 miles and on the road from 7 AM to 1 AM – 18 hours. Yes, I was tired, but I was certainly happy with the wonder of the day’s journey.